Strange but true—this axiom was never more relevant than describing many of the unusual and extraordinary occurrences during the four years of the Civil War. While much of our history is dominated by the major battles such as Gettysburg and biographies of the key commanders such as Grant and Lee, the four years of the Civil War also included a significant number of strange and highly unusual personalities and incidents that have generally escaped modern discussion. This presentation focused on these unusual and often controversial incidents and events. Topics include soldier murderers, plot to bomb the White House, the strange case of Ulric Dahlgren and the plot to kill the Confederate President, the spy who was hung twice and buried in three places, dueling generals, the ill-fated life & death of General A. P. Hill, the adventures of Dan Sickles, and other unusual personalities and events. Herb Kaufman has been a teacher, lecturer and living historian of the Civil War for more than 20 years. 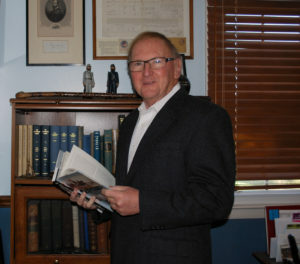 He is a founding member of the faculty of the Civil War Institute at Manor College and an Adjunct Instructor of Civil War history at Camden County College. He is a well-known speaker on a variety of topics relating to the era of the Civil War having presented programs to civic and community groups, and educational and historical associations throughout the Philadelphia area. Herb has also been a Civil War reenactor, and was an Educational Associate at the former MOLLUS Civil War Museum & Library in Philadelphia. He has received numerous awards for his continuing work in education and support of the history of the Civil War. Mr. Kaufman is a member of the Board of Directors and Curator of the GAR Civil War Museum of Philadelphia. He is currently the treasurer of the Delaware Valley Civil War Roundtable, and has been a member of the Old Baldy CWRT for more than 20 years. He is also a member of numerous historical and community organizations. Herb possesses a Bachelor’s and Master’s Degree in Education from Temple University. This entry was posted in Meeting archive on March 25, 2017 by hlj.